Running your own property is challenging business. The idea that you spend your time sitting behind a reception desk, idling away the hours as you wait for guests to arrive couldn’t be further from the truth. Most days you’re probably running frantically around trying to do five different things at once. Yet at the same time, you need to keep track of your bookings and know when a new one is made – even when you’re out at the shops, restocking supplies. 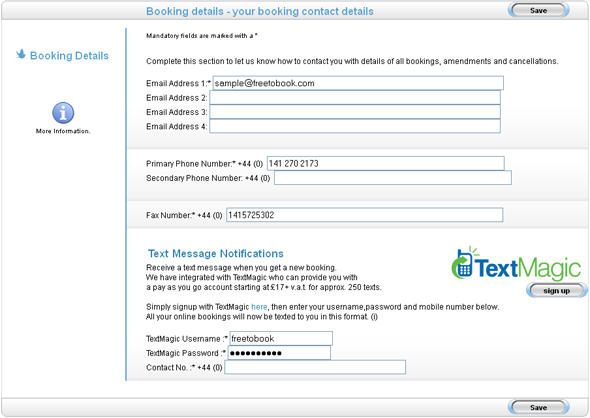 In order to create this service, we’ve integrated with the text provider TextMagic. By creating an account with them, you can easily order a fixed number of pre-paid texts. Once you’ve got this service up and running, you’ll be able to keep track of all your new bookings, no matter where you are or what you’re doing. So that’s one less thing to worry about! With facebook on track to reach one billion active users worldwide by the end of 2011, it has become not only a great way to promote your property but also a really valuable booking channel. New technology from freetobook offers a simpler way to place a booking button directly on your facebook page. Independent accommodation providers have shown great skill in using facebook as a billboard, creating distinctive pages, posting lots of great pictures (including guest photo albums) and putting on imaginative special offers. All these “soft sell” strategies are terrific. But facebook can help you in a much more direct way. It doesn’t need to be solely a customer relations tool. It can also be a new revenue stream. Our new booking button can be installed in a few simple steps and will link directly to your freetobook availability page, where guests can see live rates and book. With freetobook, you can now choose to publish reviews alongside your search results and to control which reviews you display. Early evidence shows that it can definitely help to increase your conversion rates. If a prospective customer clicks on the “reviews” box on the right hand side, they’ll be able to view a full list of guest reviews. To activate this new functionality, log in to freetobook and go to the “Reviews” subtab.